I know! I haven’t written at all this month, not a great way to start out a new blog! In my defense however, my apartment was broken into (and yes, they took my only item of any monetary value: my computer) and then my sister came to Paris for a visit so I was literally unable to write a new blog post until now. 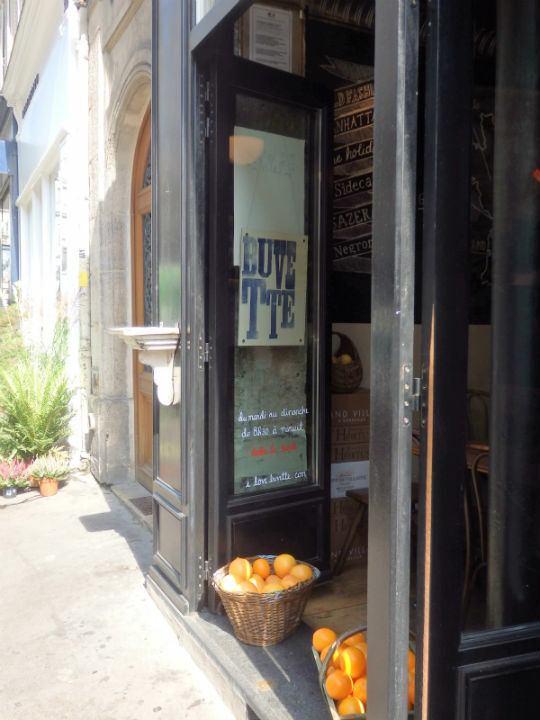 Anyways, after that semi apologetic introduction here’s a little review about one of the places I took my sister to while she was here: Buvette Gastrothèque Paris, one of my current fave restaurants in the city of light. La Buvette, still in the afternoon, before the dinner crowds arrive. I usually go here in the evening when there is ALWAYS a line-up to get in and you have to wait for an hour or so to be seated, but as I had taken the week off work we decided to drop by for lunch at around 1 pm. It was a beautifully hot September day and I automatically asked the server if it was possible to eat outside. 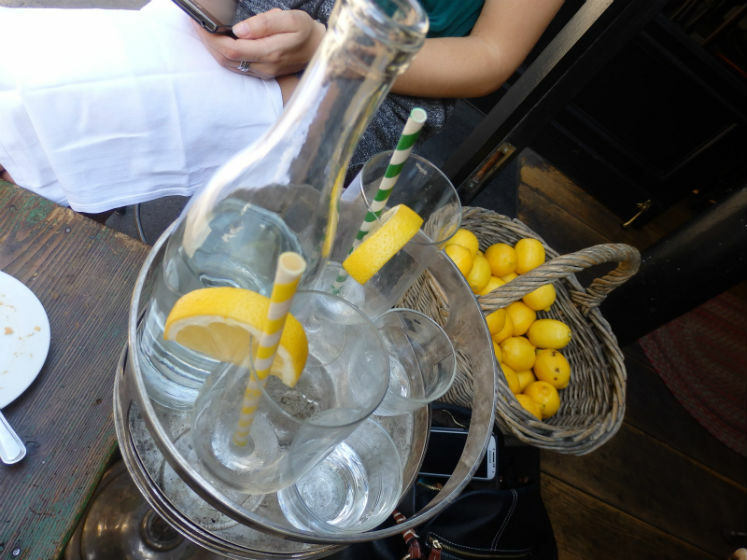 There were two little metal stools outside so we grabbed those, as well as a small wooden table, and the waiter balanced our water carafe on an empty silver ashtray stand, happy to help us out. Feeling very comfortable, surrounded by baskets of lemons and oranges, we began to look at the menu while enjoying the afternoon sun on our faces. 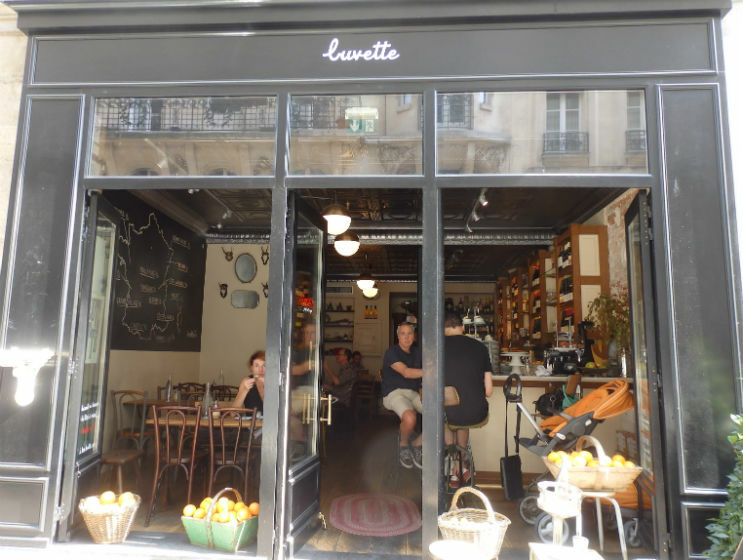 I should mention quickly that Buvette Gastrothèque Paris is owned by Jody Williams, an American who first opened Buvette Gastrothèque in New York and then decided to do the same thing in Paris. So if you can’t make it to Paris but are closer to New York, then you should check it out, apparently the dishes are similar to the ones in Paris. Her venture worked out as she now has fashionable Parisians lining up every night to try some of her mouth watering dishes, sip on one of her creative (but pricey) cocktails, or pick a bottle of wine from the extensive wine list. Back to lunch! So, we each ordered a slightly sparkling lemonade and chose three dishes to share: white asparagus with homemade aioli and an egg mimosa-like mixture (7 Euros), black olive tapenade and a generous helping of ratatouille piled onto chunks of bread (5 Euros), and thinly sliced roast lamb mixed with white beans, a tasty vinaigrette and garnished with several Kalamata olives (10 euros). Everything arrived on a large silver tray and was a feast for the eyes. A light but delicious lunch! I should mention that the dinner menu is larger than the lunch menu and I have previously tried such wonders as the mini hachis parmentier and a grated carrot, cilantro and pistachio salad mixed with a light vinaigrette. Obviously you’ll probably want to order more than we did, but remember that here they favor quality over quantity! All the dishes I have tried are bursting with flavor in every bite. 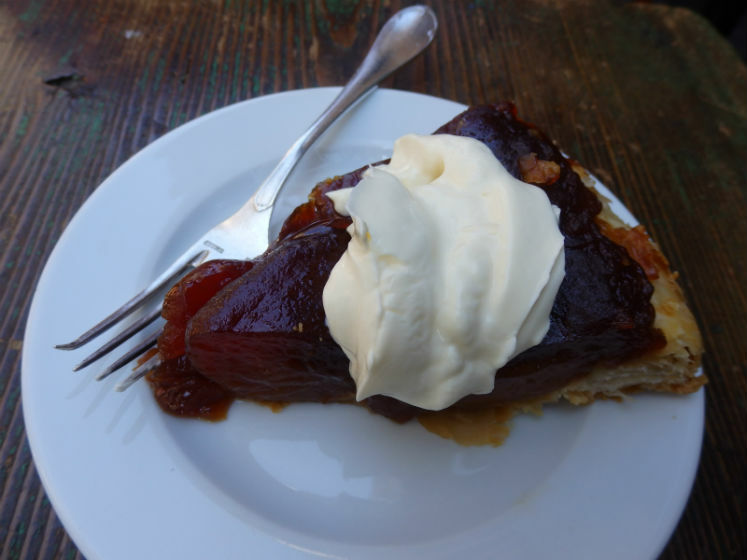 As we weren’t completely full, we ordered a tarte tatin (7 Euros), the caramelized apple upside down tart that was displayed on the long marble counter inside. The apples had that lovely rich caramel taste which was nicely toned down with a scoop of sour cream. Another great culinary experience at Buvette! Afterwards, we wandered through the trendy SoPi (South of Pigalle) neighborhood, and thought how nice it would be if we could do this more often. 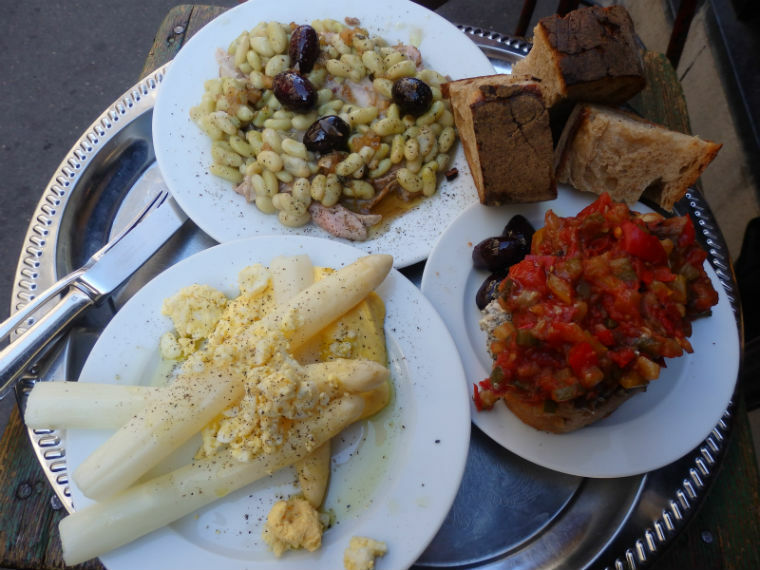 I’ll have to patiently await my sister’s next visit but luckily I can find this amazing food whenever I want, as Buvette Gastrothèque is open 7 days a week from 8:30 am until midnight! 5 little plates of deliciousness out of 5! 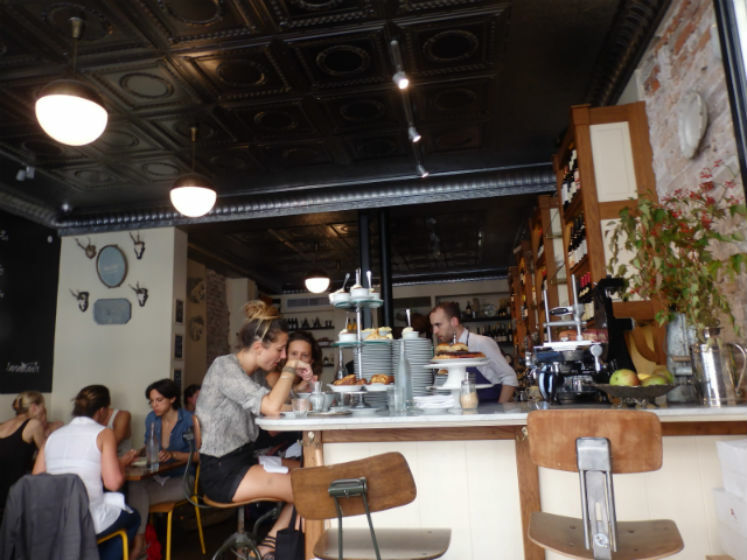 Categories: Restaurants, Uncategorized | Tags: Buvette Gastrothèque, foodies, Paris, restaurants, SoPi | Permalink. You’re in Montmartre and looking for a place to eat. If you haven’t done your homework before heading out, it is easy to sit yourself in one of the many busy restaurants along the main streets around Abbesses métro station which, I’m going to be honest, can be pretty disappointing. 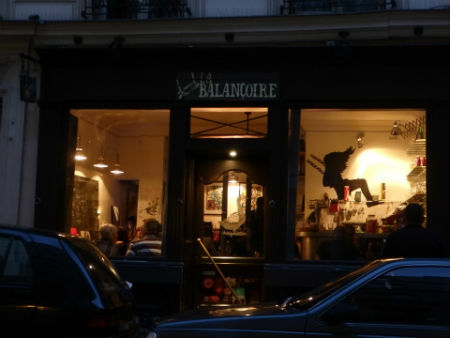 So to inaugurate my blog (*giggles of excitement*), my first post will be a review of La balançoire: a great option if you’re looking for a restaurant in the 18th arrondissement (my favorite area of Paris FYI) where the food is freshly made and tasty, the service is super friendly and the atmosphere is cozy and playful. I had passed by this place on numerous occasions and finally got to check it out with my boyfriend on a Saturday night. Luckily I had made a reservation as, apart from our table for two, the place was otherwise packed. 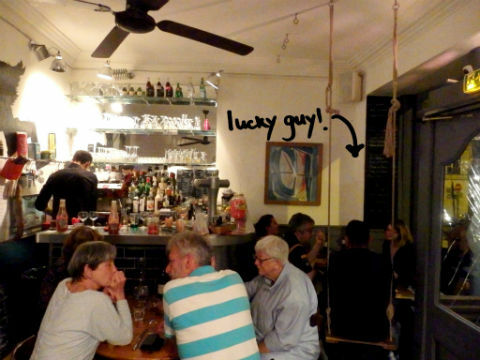 We sat down and immediately I saw it: a wooden swing attached from the ceiling with two long ropes! I mean I guess I shouldn’t have expected anything less from a place called “the swing” (English translation of La balançoire), but I was still surprised. The immature part of me wanted to go over there and try it out, but I decided, or rather forced myself, to resist (although I am totally going to come back with friends next time and reserve that table)! The smiling waiter arrived with the menu written on a big chalkboard and proceeded to explain, in detail, the 6 or 7 entrées and main courses offered. I definitely appreciated this and my usual questions (i.e. what does it come with? what exactly is in the sauce? etc.) were answered. 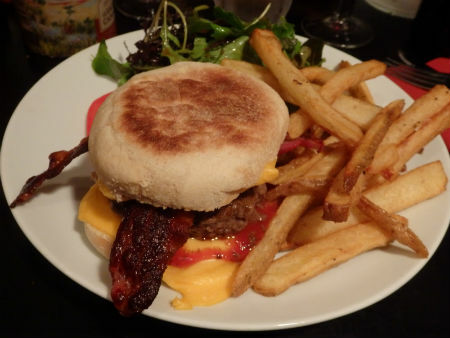 I ordered the house cheeseburger (16 Euros) and added bacon (because if adding bacon is an option, I add it…obviously!) and my boyfriend chose the beef tartare (18 Euros). 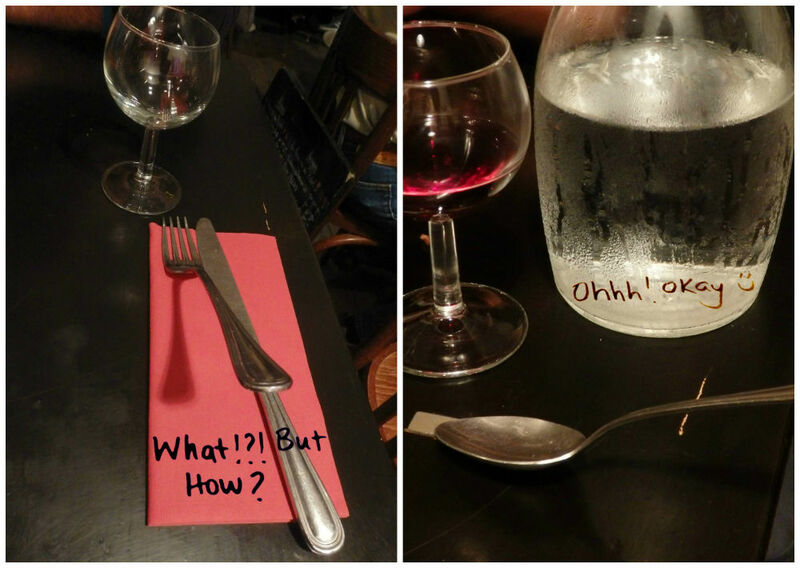 We then played with the forks and spoons that were floating above our napkins, thanks to a hidden magnet in the table, and admired the charming décor around us that included jars of French candies, cookbooks, rows of wine corks, and vintage telephones. Our dishes arrived along with a nice bottle of Bordeaux (24 Euros, but if you’re on a budget you can also just get a glass for under 5 Euros). My burger came served in an English muffin style bun (which I found original) with tomato, lettuce, a slice of cheese and two strips of crispy bacon, along with a side of super yummy fries and some mixed greens tossed in a light vinaigrette. I tried a taste of the beef tartare, presented nicely with an egg yolk on top, even though I have been scared to try this dish in the past (I’m a little paranoid when it comes to food poisoning)! 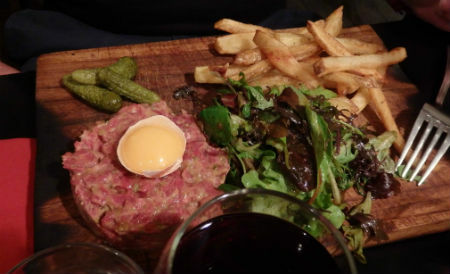 It was clearly a finely chopped steak rather than the mince beef tartare I usually see, and the taste of Dijon mustard and capers mixed in that little bite I tried was divine. 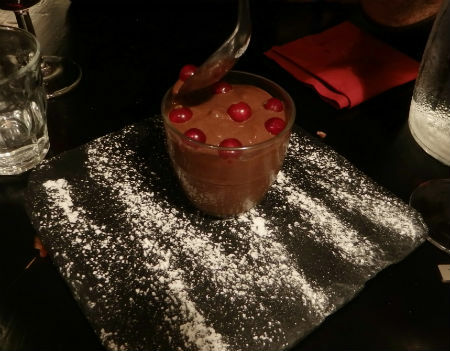 We still had some wine left, so we shared a mousse au chocolat (8 Euros) which was creamy and light and garnished with a few red currants. When we finally asked for the bill, surprise, surprise: it arrived with a jar full of candies!!! 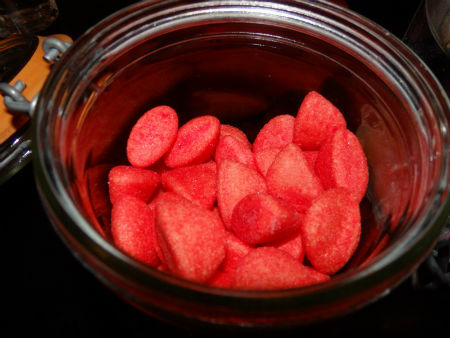 And not just any candies, fraises Tagada (which, in case you don’t know, are those yummy little pink strawberry flavored and sugar coated marshmellowy treats)! We were too excited and started grabbing them by the handful. We paused at one moment wondering if perhaps we were in fact stuffing our faces with decorative candies that had been sitting in a jar for years, but we were reassured (yes…we asked) that they are in fact for us to enjoy and that they refilled the jars regularly. Awesome!!! I need to mention again, for those of you who don’t believe that polite Parisian waiters exist, that the two male servers were beyond friendly, laughed at our lame jokes (without even a hint of an eye roll) and told us that the owners have now opened a second restaurant, not too far away, called La boite aux lettres (which I will be sure to check out soon). La balançoire is equally open for lunch, featuring a starter+main course or main course+dessert special for 15 Euros or the 3 courses for 18 Euros. 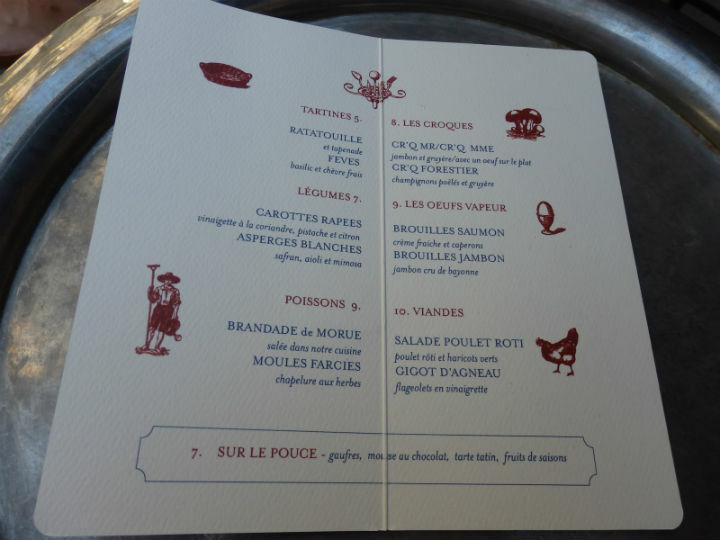 With its constantly changing menu made up of carefully prepared French dishes, I will definitely be back. My Rating: 5 strawberry marshmallows out of 5! Categories: Uncategorized | Tags: comfort food, La Balançoire, Montmartre, Paris, restaurants | Permalink.